NEW YORK.- A connected global economy, affordable global travel, and constant global migration are the clear signposts of a world that has truly shed its boundaries. Is it any wonder that interior design has itself become globalized? And nowhere will that trend be more in evidence than at the upcoming Asia Week New York 2012, which runs from March 16 to March 24. Asia Week New York is a collaboration of Asian art specialists, five auction houses, and 17 museums and cultural institutions throughout the metropolitan New York area, all promoting and celebrating the remarkable realm of Asian art, antiques and design. During the nine days of Asia Week New York, nearly three-dozen galleries throughout the New York metropolitan area will exhibit the rarest and finest examples of Asian porcelain, jewelry, paintings, ceramics, sculpture, books, bronzes, prints, photographs, and jades-all in breathtaking displays that offer today's leading interior designers--and collectors who engage them--a unique go-to marketplace for the Asian art and antiques that increasingly accentuate their work. David Kleinberg is another of today's top designers who recognizes how well Asian pieces integrate with Western furnishings and interiors. 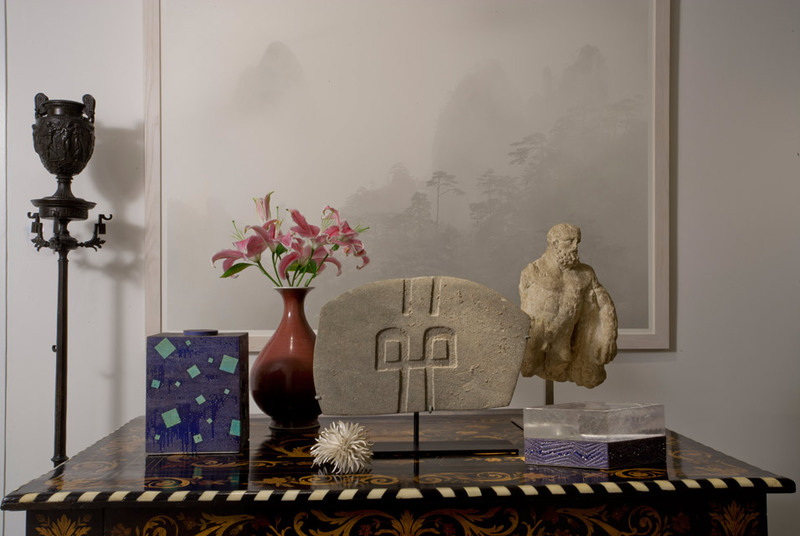 "In the dining room of my pre-war New York City apartment," says Kleinberg, "I have antique Chinese paneling that makes an arresting backdrop for a table by Raphael and an Art Deco light fixture-elements you don't associate with something Oriental. However, it works-and brilliantly. In addition, a red-bordered mirror from the 1940s hangs above the fireplace, further punctuating the subtle gilded tones of the hand-carved Chinese paneling." Korean art specialist Jiyoung Koo of KooNewYork and participant in Asia Week New York, also advocates showcasing Asian art in modern interiors. Koo has worked extensively with Skidmore, Owings & Merrill on various hotel projects in Asia, Middle East, and the United States--often from the ground up -- including renovating model guest rooms and the lobby for the famed flagship Lotte Hotel in Seoul where she placed both ancient and contemporary art. In conjunction with ST Residential, the luxury real estate company, she updated its Solair Wilshire Condominiums in downtown Los Angeles with a cohesive art identity for its model apartments and public spaces including the pool deck and elevator lobbies. "I love that the most urbane hotels reflect my generation's desire to mix art of all ages-from the West as well as from Asia," says Koo, who is now working on a commission of two works of contemporary Korean art for the lobby in the new Waldorf Astoria Beijing Hotel, scheduled to open in the autumn of 2012. Ronald Bricke is a designer who views Asian art and antiques as a requisite ingredient in sophisticated and eclectic interiors. Says Bricke: "Japanese ceramics, contemporary Chinese photography-I find the approach of mixing those with Greek, Roman and Ecuadorian antiquities exhilarating and essential to my interiors." For example, on top of a 17th century Dutch inlaid marquetry table, he juxtaposes an eighteenth-century Sang de Poulet porcelain vase, of the Ch'ien Lung period with a Roman Imperioal marble figure of Herakles, circa second century, A.D., a silver sculpture by Japanese artist Junko Mori. This vignette stands in front of "Celestial Mountains, by the contemporary photographer Wang Wusheng. The design team of Ronald Wagner and Timothy Van Dam also corroborate the increased enthusiasm for Asian design among their clients. "We have long been interested in the cross-current fusion of East and West in design-and in the culture in general," says Van Dam. "We often make use of Asian elements in various projects, using bamboo flooring and fabrics as well as contemporary Japanese basket sculpture as accessories. "After years and years of white and beige in urban interiors, the stronger palette of color used in Asia is refreshing. Asia is such a huge producer for the design world these days, and I think the cross-cultural exchange will only continue to grow as countries and cultures become more and more linked." Each year, more and more designers and their clients recognize how well Asian art and antiques complement diverse interiors. According to Joan Mirviss, a Japanese art specialist and participant in Asia Week New York, both private clients and professional designers are placing Japanese screens, ceramics, and woodblock prints in very different interiors-those with English or French eighteenth-century furnishings as well as one with Modernist or contemporary furniture. Says Mirviss: "The purity of line, the expression of asymmetry, the focus on simplicity, the remarkable palette-all these elements make Japanese art and antiques such becoming counterparts to nearly every style of interior design." Designers and collectors who are following in the direction of globalized interior design will find a rich resource in Asia Week New York. Affirms Henry Howard-Sneyd, Chairman of Asia Week New York 2012 and Sotheby's Chairman, Asian Art, Americas: "I am proud that Asia Week New York is a vital treasure for so many creative and imaginative designers. We look forward to welcoming them to this year's event which-given the ever-enlarging interest in this thriving sphere-promises to be bigger and more successful than ever."